The Hippocampus is a structure that belongs to the limbic system and predominantly forms part of the memory formation. The hippocampus is the medial section of the telencephalon (cerebrum). It is part of the archicortex. The "actual" hippocampus ("Hippocampus proprius") with its four areas CA1 to CA4 corresponds to the ram’s horn. The rostral end piece of the hippocampus forms a paw-like structure in the temporal lobe, the pes hippocampi (hippocampus foot). If you compared the involuted cortex structure of the hippocampus with a seahorse, the dentate gyrus would be the distal part of the "tail". The subiculum is the transitional area from the three-layered, archicortex hippocampus to the six-layered neocortex. It lies between the CA1 region and the ram’s horn and the entorhinal cortex. The hippocampus lies in the temporal lobe and delimitates with the inferior horn of the lateral ventricle to the lateral side. 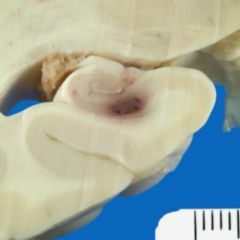 To the rostral side, you can find the corpus amygdaloideum. The caudal end of the corpus callosum represents the superior posterior delimitation. With the fornix, it draws below the corpus callosum in an arc to the mammillary bodies. The indusium griseum lying on the coprus callosum frequently is understood as the continuation of the hippocampus, since during its development, the hippocampus is situated above the corpus callosum, and only later, it arrives in the caudal location via the rotation of the hemispheres. The hippocampus receives afferent nerve fibers from the thalamus, the septum, the cingulate cortex as well as the entorhinal area from the olfactory cortex, the corpus amygdaloideum, and the neocortex areas. 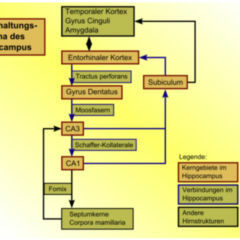 The efferent fibers of the hippocampus run in the fornix to the septum, to the amygdala, to the hypothalamus, and to the mammillary bodies, over which the Papez circuit forms. The hippocampus is a part of the archicortex. On the inside, you first find the alveus, in which the efferent fibers from the hippocampus follow their course. It continues into the fornix. From there, it forms a long strand to the spinal cord. Next to the alveus, you can find the stratum oriens (oriens layer) with its basket cells that are activated by the pyramidal cells of the neighboring stratum pyramidale (pyramidal layer) and inhibit these pyramidal cells. The stratum pyramidale is divided into the areas CA1, CA2, CA3 and CA4. Neighboring to this layer is the stratum radiatum, followed by the stratum lacunosum-moleculare. In area CA3, an additional stratum lucidum is located between stratum radiatum and the stratum pyramidale. The afferent fibers pass through the perforant path that is neighboring to the stratum lacunosum-moleculare, and terminate in the dendrites of the pyramidal cells. Many afferent fibers pass through the granule cells that can be found in the dentate gyrus. It is connected to the pyramidal cells from CA3 in the stratum lucidum via the mossy fibers. The pyramidal cells from CA3 can activate the pyramidal cells from CA1 via the Schaffer collaterals. Since the hippocampus is an important component of memory formation, no more information can pass from short term to long term memory when both hippocampi are destroyed. 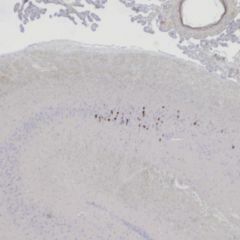 This is playing an important role especially in Alzheimer’s disease, since one assumes that the loss of neurons in the hippocampus (and the neighboring entorhinal area in the parahippocampal gyrus) leads to the characteristic retentiveness disorders. Furthermore, the neurons of the hippocampus tend to spontaneous discharges, so that eg. tumors can cause (complex focal) epileptic fits. It is supposed that an underactivity of the neurons of the hippocampus and parahippocampal gyrus can contribute to the development of schizophrenia.